And still there is no progress on the kitchen. For four straight weeks, our kitchen contractor has not shown his face, but that is supposed to change this week, which is–Yes! You guessed it!–week seventeen. The kitchen counters are scheduled to be installed this week, and that means we should finally have a functioning garbage disposal and a functioning dishwasher. Our contractor said he plans to do some other stuff too, but I’m not holding my breath. In the meantime, other things have been happening in the way of home improvement. 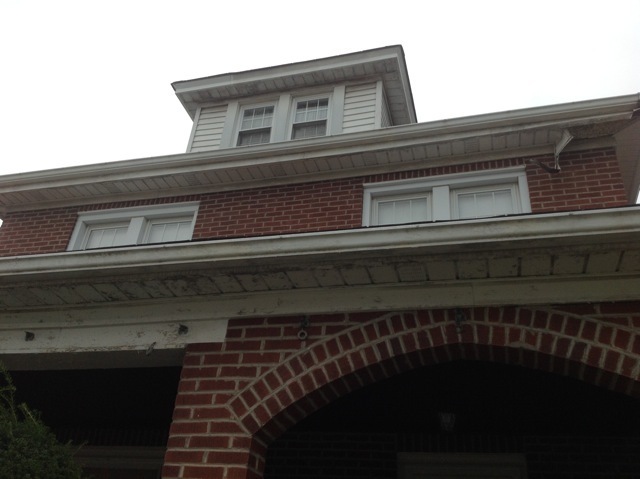 We had our peeling soffit and fascia replaced along with the leaky gutters and downspouts, and also the siding on the dormer. What an improvement! 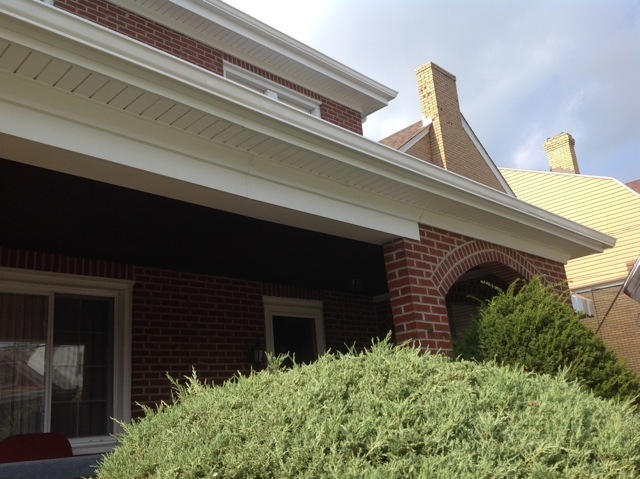 It was a big job that took six days to complete, and it wasn’t cheap, but the house looks so much better, and we shouldn’t have an ice rink this winter from leaking gutters and downspouts. 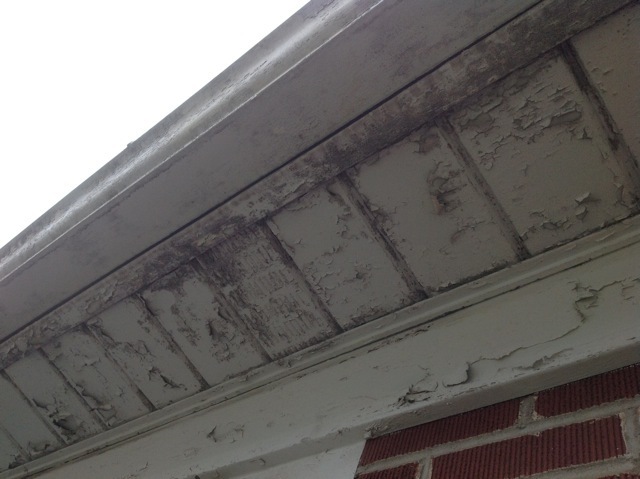 The paint was peeling from the soffit, fascia, and gutters. 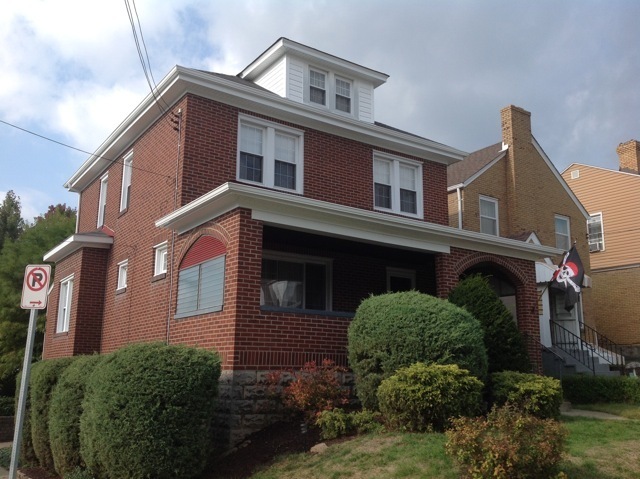 You cannot really see in the picture that the second floor was just as bad as the first, and the dormer was pretty bad, too. The damaged section in the upper right corner is just from where the workers had started to remove the old soffit. 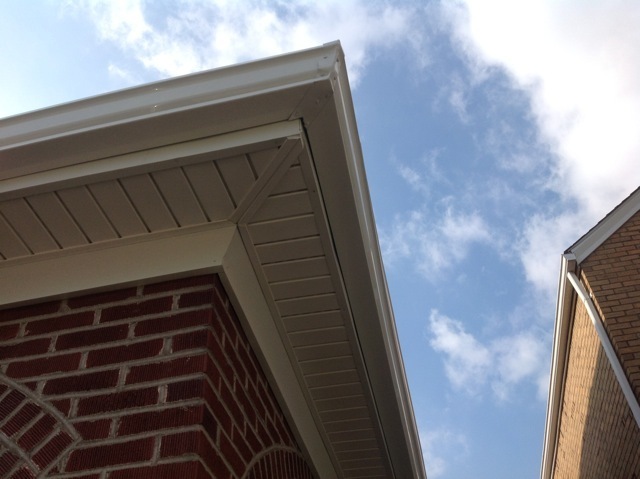 It looks a lot better now with brand spanking new soffit, fascia, and gutters. Thanks. The flag was up because it was the day of the one-game playoff between the Pittsburgh Pirates and the Chicago Cubs. Sadly, the Pirates lost. A lot of American houses have flag poles or flag holders. We like to fly our American flags on patriotic holidays, and we also fly flags for our favorite sports teams and for celebrating the seasons and various holidays. 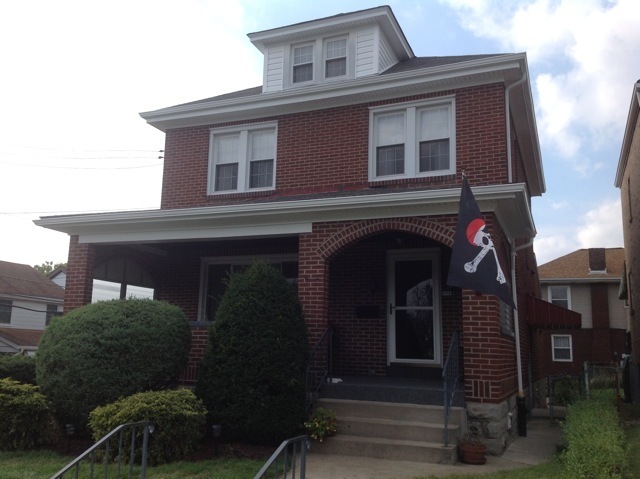 The pirate flag is for the Pittsburgh Pirates, our favorite Major League Baseball team. On St. Patrick’s Day, we fly the Irish tricolor.